I suppose the biggest family law news story this week was the announcement by Jack Straw of 'the next stage of reforms aimed at increasing transparency and confidence in our family justice system'. The plan is to 'enable reporting of the substance of family proceedings, while protecting the identities of families and children' with the aim of 'increasing public understanding of and improving confidence in the family justice system', building on 'the successful reforms in April'. Lucy Reed over at Pink Tape has already expressed her views upon this albeit, as she admits, in a somewhat sarcastic fashion. For my part, I am always a little concerned when, as so often these days, reforms are a knee-jerk government reaction to media pressure. Having their work subjected to trial by media is hardly going to improve morale amongst over-worked family law professionals, particularly social workers, who are already feeling besieged by constant media criticism. Unsurprisingly, there is a shortfall of people wanting to become social workers, which Ed Balls want to fill with two hundred 'lawyers, teachers and other professionals'. Err... no thanks. Today I read that Conservative think tank the Centre for Social Justice will recommend that there be a compulsory three-month "cooling off" period before divorce proceedings can be commenced, one of a number of proposals contained in a report Every Family Matters, to be published tomorrow. The idea is that this period "would be used to encourage both parties to reflect on their marriage and to gather information about the scope for reconciliation and key issues such as the financial impact of a split". I'm not sure how well this will go down - for many couples it will just add another three months to the misery before they can get on with rebuilding their lives. The report will also call for the retention of a fault provision in divorce proceedings, something which I think the vast majority of those working in the family justice system disagree (indeed, the last Conservative Government attempted to bring in no-fault divorce). Fault is pointless: very rarely can a marriage breakdown be said to be entirely the fault of one party, it involves the court in the issue of 'revenge' and, above all, it reduces the chance of matters being resolved amicably between the parties. Stop the secrecy and the gagging of parents forced to remain anonymous and unable to complain under their own names. - Stop adoptions of children for emotional abuse or for "risk", and open adoption records to children already adopted. 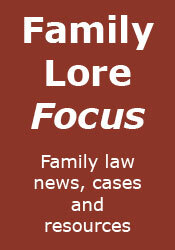 - Stop judges deciding cases of long term fostering or adoption, and give juries the final decision. Better still abolish forced adoption altogether!